Supplies: glass pillar candle (see picture.) Paper (tracing paper is lovely for this), markers and crayons and paints, scissors, glue. Images from magazines or printed out. Really anything that catches your spirit’s attention and heart will be perfect. Goals: to reflect on 1. Our own divine pregnancy, 2. Your guiding star, 3. Shelter, and 4. The dance of darkness and Light. There are five parts to this reflective exercise. You may spread each part out over the span of four and a half weeks or spend an afternoon going through the parts. The resulting candle is one intended to inspire and sustain your personal ministry in the world. Once complete, light it as a prayer. 1. Our Own Divine Pregnancy. It is told that God impregnated Mary and a baby, flesh and blood, resulted. I believe when we co-conspire with the divine, goodness and love spring forth as well for us in service to the world. When you sit very, very still, what can you feel stirring in the womb of your heart? What in your life is Calling you to co-conspire with the holy in order to birth this goodness that is larger than yourself and at the same time uniquely of yourself? Take a moment and draw whatever images or words come into your consciousness. As you go about your day look for images and add those to your paper. Go through magazines and look for words or images. Paperclip your findings to the paper. Set this all aside for the culmination at the end. But feel free to come back and add as things come to you. The Star of Bethlehem guided Joseph and Mary to Bethlehem to where the Light of the World was born. It guided sheepherders and kings to find the Light of the World. What is your guiding star? What three values guide your life and serve as a litmus test as to what if your work to do in the world? Take a moment and draw whatever images or words come into your consciousness. If the guiding values are verbs, I invite you to put them in the active tense, “ing” and try those on. Once Mary and Joseph arrived in Bethlehem they were repeatedly turned away. As the story is told, there was simply no room at the Inn. They were offered a space reserved for lowly animals. When have you turned other people or ideas away because there was just no more room, no more energy or other resources to make this person or idea a priority? What in your life could you evict to make room for unknown, divine people or ideas? Take a moment and listen to your still, small voice. What would happen if you evicted the “should’s” or meaningless minutia, the noise from your life? What is keeping you from letting go? And what could this new space in your life, this waiting shelter, look like? We are now in the darkest time of the year. Many creatures hibernate. What is hibernating within you? The darkness is often a time of angst for people. What pulls on your heart and craves the comforting glow of light? And many curse darkness as a symbol of evil. Evil, being that which disconnects us from love and divinity. What in your life disconnects you from love, the divine, and your true self? Whether darkness means sleepy hibernation, a time of sorrow and worry, or pure evil, sit with it. If it feels too much, ask God to hold it for you while you look at it. The antidote to darkness is Light. What light are you calling into your life? What light do you send out to the world? Imagine this Light diminishing the Darkness. Reflection: Lay out all the images and take them in. How are they connected? What images stand out for you? What images seem no longer relevant? Feel free to thank them and then set them aside. Looking at all the images does a scripture or hymn come to mind? What prayer emerges? What do you need from God to say “yes!” to the coming Light? Now is the time to assemble the images and words and glue them onto your candle. Consider cutting pictures and words from your journal pages to glue onto the glass. 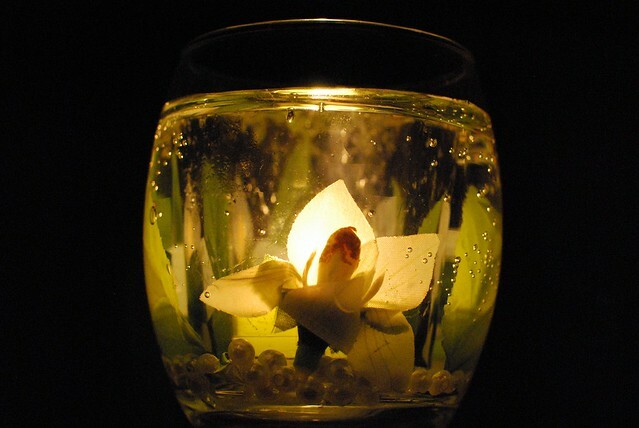 Once the reflection candle is just the way you want it, light it and sit quietly with it. Bask in it’s glow. Take in this collage of images and words. What new do you see? What invitations or instructions do you see? What are you most drawn to? What prayers float from it? May you this candle collage inspire and sustain your personal ministry in the world. May this candle be a guiding prayer. Remember you come from Light and at the same time you are Light of and for the world. Go out and spread bright blessings. The world is waiting. ©2014. Permission to use this reflection exercises freely and to change it up to fit your needs. Please credit Rev. Tandi Rogers as appropriate. She is an ordained minister in the Unitarian Universalist tradition. Currently residing in Tacoma, WA and serving the Unitarian Universalist Association as their Innovation & Network Specialist.